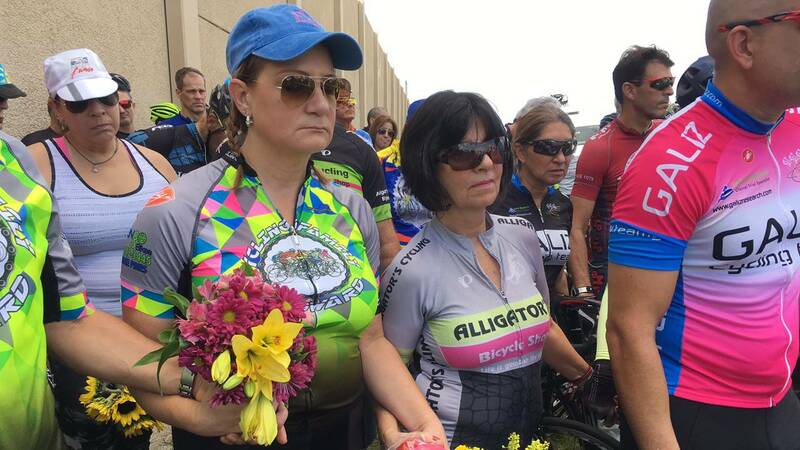 DAVIE, Fla. - Friends and family of two cyclists who were killed last week in Davie gathered at the crash scene Sunday to remember the fallen riders, urging motorists to avoid distractions and share the road with bike riders. "This is the start of a movement that's going to shock the whole entire cycling community and everyone who drives a car," said Arnie Prieto, president of Cycling Family Broward. Prieto called on the cities of Sunrise, Weston and Davie to help protect cyclists on weekend mornings by stepping up enforcement of speed limits. Davie police said 33-year-old Nicole Vanderweit was driving along State Road 84 near Southwest 148th Avenue around 8:30 a.m. when she struck a group cyclists. Denise Marsh, 53, and Carlos Rodriguez, 62, were killed in the crash and three others were seriously hurt. Police said Vanderweit was distracted by the bright sun and something inside her car. Police said they did not believe Vanderweit was using her phone at the time of the crash and she has turned the device over to authorities. "We all enjoy the same sport, and it’s a tragedy to see somebody killed doing something they enjoyed," said Phillip Liberson, a cyclist from Fort Lauderdale. Carlos Rodriguez's son, Danny, joined dozens of cyclists gathered along the shoulder of the road with flowers and black memorial pins. The group planned to attend Carlos Rodriguez viewing after the roadside memorial. "All I have to say is that my dad has touched countless lives, even those that may not have met him or seen him through his Facebook posts and everything," Danny Rodriguez said. Danny Rodriguez said the Broward County cycling community became a second family to his father. "My dad loved every single one of you just like he loved us, and he's continuing to touch countless lives even watching over us in his eternal walk," Danny Rodriguez said. "I know my dad is looking down on everyone with a smile on his face because everyone remembers him for his smile."